As a Montessori 3-6 and 6-9 trained teacher, I have a lot of respect for Waldorf education, even though I was drawn to (fell in love with!) Montessori at a young age (23). And as a Montessori teacher, I have recommended it for a few children (usually two students per year) who were graduating from our 3-6 classroom, because I (we) felt it was a better choice for those particular children. Their interests, or should I say passions, were not with the Montessori materials, and certainly not academics like phonics and simple math, but instead they loved arts, crafts, practical life, the outdoors, and botany. One of the attributes I like about Waldorf is its sensitivity for the development of the WHOLE child: mind, body, and spirit. Also, there is a lot of emphasis on fine motor (like weaving, knitting, sewing), nature, cooking, playing, arts and crafts, large motor play, story telling, poetry, songs, critical thinking, and literature. Speaking of large motor, children really benefit from an emphasis on large motor movement activities, which aid in the function of right and left brain development: thus improving reading and writing skills between the ages of five and nine. In Montessori, there is a Sensitive Period for Reading at age five (Sensitive Period for Writing at age 4 1/2). But there is another sensitive period for reading at age eight. And Waldorf waits until the second sensitive period at age eight to start teaching children how to read. Up until that age, the language focus in Waldorf is on the SPOKEN word through storytelling, poetry, songs, and verse. 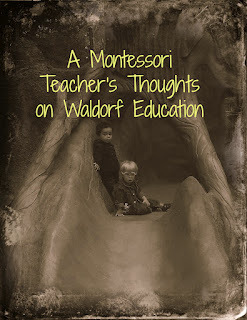 If you think your child would do better (and be happier) in a Waldorf-style environment, with arts, crafts, cooking, large motor, fine motor, songs, story telling, and a lot less emphasis on academics until the later years... then Waldorf just might be the better choice. Read some Waldorf blogs, my favorite is the Magic Onion. And they have a great article you can print out and read. Don't miss my next podcast episode or blog post! Subscribe to Confessions of a Montessori Mom! You may also be interested in my affordable online Montessori and homeschool online programs at Montessori for the Earth.